I was going to say it’s the opening of the season but this is probably the opening of the year! Avant-garde, beautiful, hip-and-happening is the quickest way I can describe Skinny Fox. 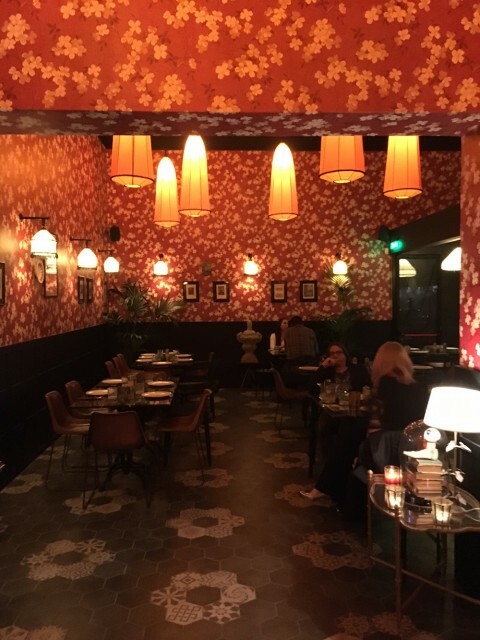 A restaurant that will allow you to dress-up for a night out, enjoy a meal in a buzzing atmosphere and eat well! We went on the first Saturday of operation, not a very good idea when one wants to write a full review of a new restaurant. 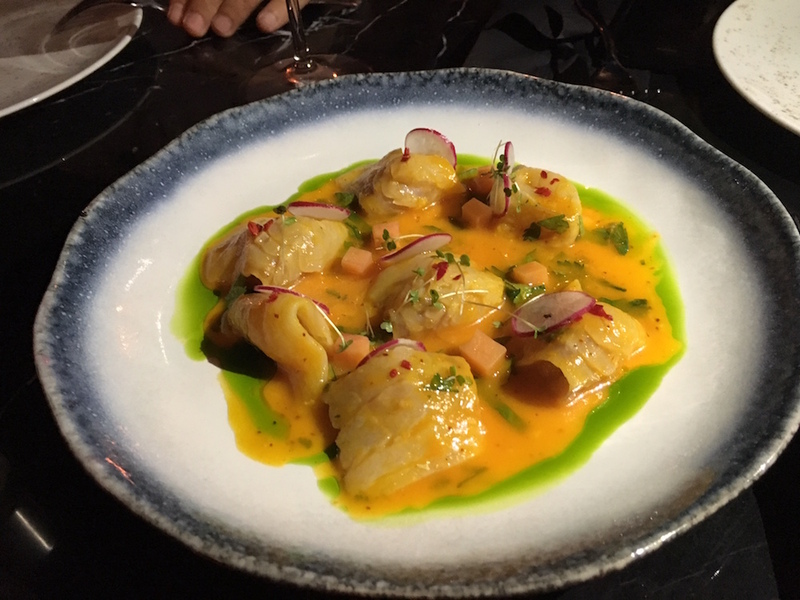 The first week (or month even), is not representative of the situation as restaurants are usually disorganised with either amazing food that gets worse, or bad food that gets better. We were surprised to see that this was not the case here. Yes, it was packed and everyone who is anyone was at the restaurant but our meal was served without a glitch: warm, yummy and on time. The menu is merely 2 pages long, something that I liked. I couldn’t see any wakame salads or burgers something that I also liked! Apart from a handful of light salads one can find an international selection of starters like a Seabass Ceviche, a lightly spicy octopus, Iranian meatballs and a beef carpaccio. Although there wasn’t a show-stopper I enjoyed all of them. 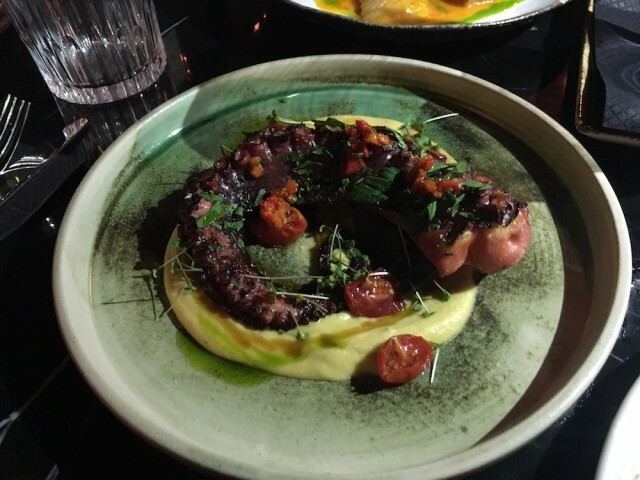 The Iranian Dolmeh with mince beef, raisins and spices were lightly sweet with a lumpy texture, the Mediterranean Octopus with fava puree was tender and very well seasoned and the ceviche was tasty although a bit too lemony (nothing has managed to beat Bastione’s ceviche yet!). The Beets & Goat’s cheese salad with roasted almonds and thin beetroot slices was light but filling. As a main course we each had our own dish. 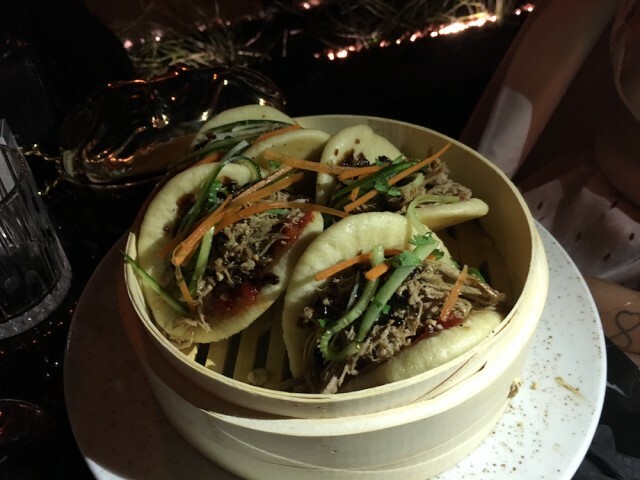 The Beef Fillet Robata with vegetables was tender and moist while the pulled duck in homemade steam buns with a familiar oriental flavour were delicious, a main course that I will definitely opt for next time. The Ribeye steak on the bone for 2 (which, believe you me, is not for 2), was well cooked medium, tender and lightly flavourful. Last but not least the desserts did not fail to impress us with a rich but not overbearing chocolate cake and a deliciously creamy millefeuille with what must have been a mascarpone filling. I just love it when the end to a good meal is not disappointing. And I left the best for last: The décor. I expected nothing else by Constantinos who is always a pioneer and a visionary. The retro décor, something between a English member’s club and an old tea-room is a breadth of fresh air. Some may say it’s a bit heavy for the summer but the large veranda will make up for it. Yes, there is a bar for drinks before, during and after dinner. We paid 50€ each for A LOT of food, 3 bottles of wine and 4 cocktails for 6 people.